The first phase of the ambitious ReNEWW House project has slashed this home’s HERS score to near zero. IN JULY 2013, Whirlpool Corporation partnered with Purdue University on a retrofit of a late 1920s bungalow in West Lafayette, Indiana. The goal: to create more livable spaces while lowering operational costs and environmental impacts. The ReNEWW house includes 2,864 sq. ft. of conditioned space, three bedrooms, two baths and a basement laboratory. Called the ReNEWW house, for Retrofitted Net-zero Energy, Water and Waste, the structure will be renovated in three phases, with each phase lasting roughly a year. Phase one, a deep-energy retrofit, was completed in the summer of 2014. Up to three graduate students participating in the Whirlpool Engineering Rotational Leadership Development (WERLD) program will live there throughout the project. They and Purdue researchers will monitor more than 70 data points inside and outside the home to evaluate its performance. 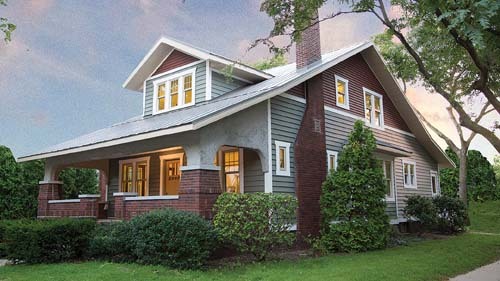 One goal of the ReNEWW project is to demonstrate the feasibility of renovating a 1920s home to meet or exceed new home efficiencies, while maintaining all the charm and character of an older home. While there are several academic programs in the U.S. that utilize net-zero energy homes for research purposes, these homes are typically new builds and vacant, says Groll. Living in the home allows students to realistically replicate the impacts residents have on their homes. Green Goose Homes, a builder in the Lafayette, Indiana, area that focuses on using advanced techniques and products to build resource-efficient homes, served as the ReNEWW House’s general contractor, providing jobsite supervision and management. Several leading building materials manufacturers are also helping to take this 84-year-old home into the future (see sidebar below). The laundry pair includes the Whirlpool Duet HybridCare clothes dryer, which regenerates energy during the drying cycle to reduce overall energy consumption. Prior to the start of the project, the ReNEWW House received a 177 HERS rating with an estimated annual energy cost of $3,728. Three months later, with the deep-energy retrofit completed, the house was reevaluated and received a HERS rating of 1. The post-renovation estimated annual energy cost is just $126. As Whirlpool Corporation and Purdue University work together toward phases two and three of the ReNEWW House project, researchers will continue monitoring temperature, relative humidity and energy consumption, Bowler says. Insulation. Lapolla Industries provided its FOAM-LOK spray foam insulation, which was applied in the wall stud cavities on the main floor, in the basement and in the attic. FOAM-LOK includes Honeywell’s Solstice, an ultra-low global warming potential (GWP) and non-ozone-depleting formulation. The ReNEWW House application marks the first time Solstice has been used in a residential structure. Heating and Cooling. Enertech Global provided a GeoComfort Compass Series geothermal system. For every one unit of energy that is put in, this efficient system collects three free units from the earth. Appliances. 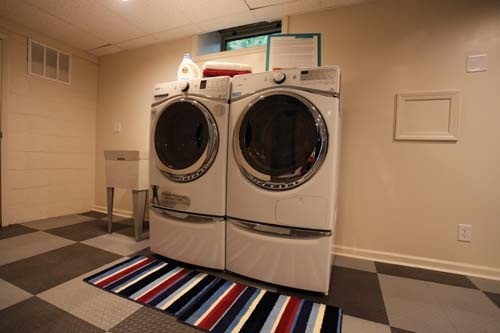 Whirlpool Corporation installed a high-efficiency Whirlpool laundry pair and kitchen suite that contribute to the overall goal of net-zero energy. Included in the laundry pair is the ventless Whirlpool Duet HybridCare clothes dryer, which uses a refrigeration system to dry and recycle the air that a conventional unit would vent outside. The Whirlpool Duet steam front-load clothes washer has been rated a CEE Tier III, the highest possible efficiency rating available. The kitchen suite includes a Whirlpool 6.7-total-cu.-ft. double oven electric range with induction cooktop, the industry’s first; a Whirlpool Gold Series dishwasher with Sensor Cycle, and a Whirlpool 20-cu.-ft. counter depth French door refrigerator with a temperature-controlled, full-width pantry and Accu-Chill temperature management system. The refrigerator utilizes Solstice low-GWP foam blowing agent. Lighting. ETi Solid State Lighting, Inc., a subsidiary of Elec-Tech International Co. on behalf of Whirlpool Corporation, provided LED lighting products, which use 80 to 90 percent less electricity than traditional incandescent light bulbs. These include recessed light kit fixtures, composed of an LED light bulb, module and integrated trim that fit into existing cans. Windows, Doors and Siding. Ply Gem supplied the siding, windows, trim and exterior doors. The windows feature triple-paned, krypton-filled lites with frames and sashes welded together into single, weather-tight units made from recycled materials. The custom-built fiberglass doors feature composite frames and low-maintenance materials that won’t dent, warp, rot or crack. The siding, made with 50 percent recycled materials, incorporates a polystyrene foam insulation backing that wraps the home’s exterior envelope with a continuous blanket of insulation up to 1.25 inches thick. Low-maintenance cellular PVC trim is utilized throughout. Renewables. SolarZentrum North America (SZNA) contributed the certified Combined Heat and Power (CHP) Solar PV-Therm modules. The CHP solar module will simultaneously provide up to 900 watts of combined electrical and thermal energy. It’s also capable of producing up to 30 percent more electricity, and up to four times more total combined energy output, than a conventional solar panel.